Current Market News is posted on my Blog page. Looking at the past three years of sales there is an upward trend in total sales over $1 million except for the $2 million to $4 million range in 2015. The total stats for 2015 however were higher than the previous year. I collected these statistics from MLS for the time period between January 1st to October 31st, years 2014 to present for sales on Lakes Rosseau, Joseph and, Muskoka including Little Lake Joe, the Joseph River, Indian River and Mirror Lake. Keep in mind, these are MLS statistics only and do not reflect any Exclusive listed properties sold. Also, these stats are for cottage waterfront properties only and do not include vacant land. More and more people are entering the Muskoka market. Cottage property purchases are discretionary and from these stats it appears that more people have the funds to purchase a second vacation waterfront cottage property than in the past. Another consideration for such an increase is the low interest rates. Its difficult to say who exactly the buyers are due to the current Privacy Act but with our Canadian dollar the way it is I'm almost certain there are a few foreign buyers taking advantage of their economic position over the Canadian Peso. Personally, I have sold more properties at higher list prices than ever before in the last 22 years of my career including the years prior to the economic downturn of 2008. While I attribute much of my success to the many referrals from satisfied past clients, I cannot ignore the rise in demand and purchasing costs of Muskoka waterfront cottage properties. My average buyer is looking for specific property attributes including: large frontage and acreage, a preferred North West exposure for summer sunsets, high quality finishings in structures and landscaping and perhaps most importantly, privacy from neighbours, road noise and boat traffic. All of which comes at a price. I have had several people looking at cottage property as an investment and while I believe that any real estate purchase is an investment, I always explain to my buyers that there is value in use and the making of memories in Muskoka. These statisics are taken from MLS and based on sales from Muskoka Real Estate Brokerage Firms for the calendar year January 1st, 2015 to December 31st, 2015. Prepared by: Marketing Department, Chestnut Park Real Estate Limited, Brokerage. Please contact Jack Janssen*, Sales Representative at Chestnut Park, Port Carling for all your Muskoka waterfront cottage real estate needs. *Jack Janssen is a luxury cottage recreational property specialist whose niche market includes only waterfront properties on Lakes Joseph, Rosseau, Muskoka and perimeter lakes. With this specific focus, his residence on Lake Rosseau and over 21 years’ local experience Jack has developed a loyal clientele base who trust Jack implicitly to fully understand and represent their best interests. Thus far, from January to May 26th, 2016 Jack has represented his Sellers and Buyers in over $20,600,000 in transactions. With Jack’s representation via the high end, luxury, boutique firm Chestnut Park Real Estate Limited, Port Carling, and his affiliation with Christie's International Real Estate – you can’t go wrong – whether you are listing your cherished Muskoka waterfront property or looking to create new memories. All of the markets encompassed by the Muskoka and area Realtor’s Association produced positive numbers in 2015. The Association reported 1160 recreational properties sold, 23 percent higher than the 890 properties reported sold in 2014. Lake of Bays reported 112 properties sold as compared to only 84 in 2014, an increase of 33 percent. The Haliburton Highlands also reported strong numbers. There were 320 recreational property sales in 2015, a 30 percent increase compared to the 246 properties sold in 2014.2015 was a banner year for the Muskoka and area recreational market. Chestnut Park and its sales representatives were responsible for the highest volume of sales in the firm’s history, surpassing even the exceptional results achieved in 2014. Muskoka’s big lakes, Lake Joe, Lake Rosseau, and Lake Muskoka, have produced increased sales for three consecutive years. In 2013 there were 223 reported sales on the big lakes. That number increased to 266 in 2014 and then further increased to 292 in 2015. Compared to 2013 and 2014, the results achieved are 19 and 31 percent respectively. to $1 Million) than in 2014. For example if we review sales having a sale price in excess of $1.5 Million, the average sale price for these properties sold in 2014 was $3,002,028, but up substantially to $3,245,708 in 2015, an increase of more than 8 percent. Further indication of the strengthening of the big lakes market in 2015 is the time it took for cottage properties to sell and the sale to list price ratio of these properties. In 2014 it took 80 days (on average) for all properties with a sale price of $1 Million or more to be reported sold. For properties in the $1.5 Million plus range it took 82 days from listing to sale date. In 2015 both of these numbers decreased to 73 days for properties having a sale price of $1 Million or more and 78 days for those properties having a sale price of $1.5 Million or more. Similarly the sale to list price ratio improved from 93 percent to 94 percent in both of these categories year over year. What these statistics tell us is that there were more sales in 2015, these sales happened faster than in the past, and that sale prices were closer to asking prices than past years, all signs of a strong, broad market. Chestnut Park and its sales representatives produced a record breaking year for our buyers and sellers in 2015. Total dollar volume of sales exceeded $250 Million, the first time that that number has been surpassed. Our total number of recreational property sales was also up by 10 percent, another record for the firm. In Port Carling our office exceeded the results of our next closest competitor office by more than 46 percent in dollar volume of sales, a great accomplishment by Chestnut Park’s sales representatives. Although 2015 was a market high, a number of negative economic changes appeared in December and have carried over into the early days of January. These changes cloud the horizon as we attempt to peer into 2016 and the market we might encounter. In December the Toronto stock market dropped precipitously, a drop that has continued into the first week of January 2016. The Bank of Canada recently reduced its 2016 forecast to less than 2 percent growth, probably closer to 1.5 percent. Western Canada continues to suffer as a result of declining oil prices. As of the preparation of this report oil prices were hovering at $30 a barrel, the lowest they have been in more than 10 years. On the international scene China continues to struggle, with no sign of change in its stagnating economy. When the Chinese economy slows, commodity oriented countries such as Canada are immediately impacted. Recreational property purchases are discretionary. History has demonstrated that during slow economic periods recreational markets also slow. Hopefully by the time the market gears up in early spring some of these dark economic clouds will have cleared. The low Canadian dollar (69.57 cents to the American dollar at the time of this report) may see more Americans purchasing properties in the Muskoka and area marketplace. The bottom line is that we enter 2016 with various economic uncertainties that were not present in 2015. It’s a rainy Friday morning in Muskoka hence I’m not out showing or listing property today. I took a moment to look at the sales statistics for the last 3 years and am able to provide you with an accurate account of the Muskoka market. Many have been commenting that the Muskoka market is “hot”, including national and international media. Don’t get too excited, Muskoka makes the news every few years. In actuality the market has remained fairly consistent over the last 3 to 4 years but is not what I would describe as hot; cottage prices have not dropped and I would say increase in price has been slight at best. Here are my MLS stats from January 1st to July 17th from years 2013 to present on Lakes Rosseau, Joseph and, Muskoka including Little Lake Joe, the Joseph River, Indian River and Mirror Lake. Both mainland and Island cottage properties. I’ve also included the sales from 2007 prior to the economic downturn which occurred in 2008. Some would say that these MLS stats are not an accurate reflection of the total sales as there are also many exclusive and pocket listing sales, data not added to the MLS stats. These non-MLS sales are consistent throughout the years however and really do not alter the numbers. The fact of the matter is we could definitely use some refreshing new, well-priced product. All of this so-called “Hamptons of the North” talk has skewed the perception of the market in the eyes of the seller. Sellers are expecting huge dollar value increases and Buyers are shying away. So, as I always say, a well-priced property will sell in a reasonable period of time. 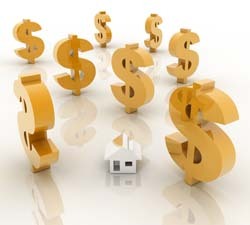 In fact, some overpriced properties on the market will actually help well priced properties reap higher dollars. Study the stats above. Where is this increase in sales as told by recent media articles? Also, Sellers are assuming that the American buyers are snapping up Muskoka real estate due to the strong USD, this is simply not the case. My contacts in Europe have told me that Americans are purchasing property in France, Europe, Spain, etc. contrary to recent articles. Don’t get fooled by the media reports. None of us has a crystal ball, if you are in the market to sell or buy now is as good a time as any. I’ve always said a cottage is a lifestyle and if it turns out to be a great investment this is a bonus. Attempting to “time” the market is extremely difficult. Keep in mind it’s a dog eat dog world out there and this is especially evident in the real estate business. The quote “List to Exist” are words many Realtors live by and they will acquire listings at any price just to have product to advertise in hope of attracting new buyers, then spend much of their time getting you to reduce your list price. So, please know your REALTOR®, check their history of local experience, sales, success and accurate market knowledge and make the correct choice when listing or buying Muskoka cottage properties. If you have any questions or to comment please do not hesitate to contact me. The market during the first four months of 2015 has been dramatically different than last years first four months. This is unexpected given the fact that both early last year and this year we experienced severe weather conditions. Cold temperatures, heavy snow falls, and unpredictable weather late into April have been once again the norm. Last year the Muskoka Haliburton Association of REALTORS® reported 88 recreational properties sold in the first four months last year which is consistent with the 90 that were reported sold in 2013. This year that number almost doubled to 155 properties which is an increase of more than 75 percent. This is an exciting turn around and shatters the myth that sales early in the year are determined by weather. The numbers are fairly consistent across all regional market places. In the Haliburton Highlands recreational property sales increased from 25 to 47 which is 88 percent. In the Lake of Bays region the increase was even more dramatic. Last year only 9 properties had been reported sold in the region, this year that number increased to 23, this is an increase of more than 150 percent. The increase of recreational property sales on the Muskoka big lakes (Lake Joe, Lake Rousseau, and Lake Muskoka) was a little less dramatic. In the first four months last year, 23 properties had been reported sold. This year that number increased to 35, a 52 percent increase. At this point in the year it is difficult to determine to what extent this increase in sales volume is impacting sale prices. Chestnut Park’s agents were responsible for two high end sales during the month of April, one sale at $3,572,500, and another relatively close behind at $3,500,000. These sales indicate that higher priced properties are beginning to sell at an early stage in the selling cycle. Sales generated by Chestnut Park agents are reflective of the overall market improvement. Sales were up by 40 percent in the first four months of this year as compared to last year, which was only $850,714, an increase of almost 45 percent. Active listings are, more plentiful heading into the second half of last year. Overall there were 760 recreational properties available to buyers last year. At the beginning of May this year there were 917, an increase of 20 percent. Except for Lake of Bays, increasing inventories are available in the Haliburton Highland (256 this year compared to 174 last year) and the Muskoka Big Lakes (241 this year compared to 206 last year). Looking forward we should anticipate at least in May, June, and July, a market similar to what we experienced last year. During those months the recreational market picked up exponentially making up for the early year short falls in sales. If sales exceed last years’ results, we can anticipate a record year for the recreational market places. *Market Report provided by Chris Kapches, CEO Chestnut Park Real Estate Limited. Contact Me to Discuss the 2015 Muskoka Market or for Confidential No-Obligation Market Evaluation of your Property. Ever wonder why I switched brokerages? The proof is in the pudding. Chestnut Park, Port Carling boasts the highest volume of Muskoka waterfront property sales; both MLS and those listed exclusively*. The following graphs indicate the vast sales difference between the leading brokerage Chestnut Park and the other brokerages in Muskoka. Two key factors contribute to our success. 1. Chestnut Park employs the most experienced, successful Sales Representatives throughout Muskoka. 2. Chestnut Park lists the majority of the properties that come to market which allows me to have "before-hand" knowledge of upcoming available product. Around this time last year I posted a very similar graph indicating Chestnut Park's top performance in Muskoka in 2013. I expect this trend to continue given that Chestnut Park is Muskokas' luxury boutique leading real estate company. Please email me with any questions or comments and have a great weekend! *Statistics provided by: Chris Kapches, President & CEO of Chestnut Park Real Estate Limited, Brokerage. The recreational resale market started relatively slowly in the spring of 2014. Although weather conditions were not as extreme this year as last, they were severe enough that they negatively impacted the early market. However as the year progressed the number of available properties for sale increased and with an increase in inventory, sales also increased. By the end of October, sales of recreational properties had exceeded reported sales for the same period in 2013. This marks the second consecutive year in which sales have exceeded the number of reported sales from the year before. The Muskoka Haliburton Orillia Association of Realtors have reported the following market data. Overall the number of recreational properties available for sale increased by almost 11 percent, from 1150 in 2013 to 1273 this year. This follows on the heals of a 9 percent increase from 2012 to 2013. Similar increases are evident in the various recreational cottage districts that Chestnut Park agents work with buyers and sellers. 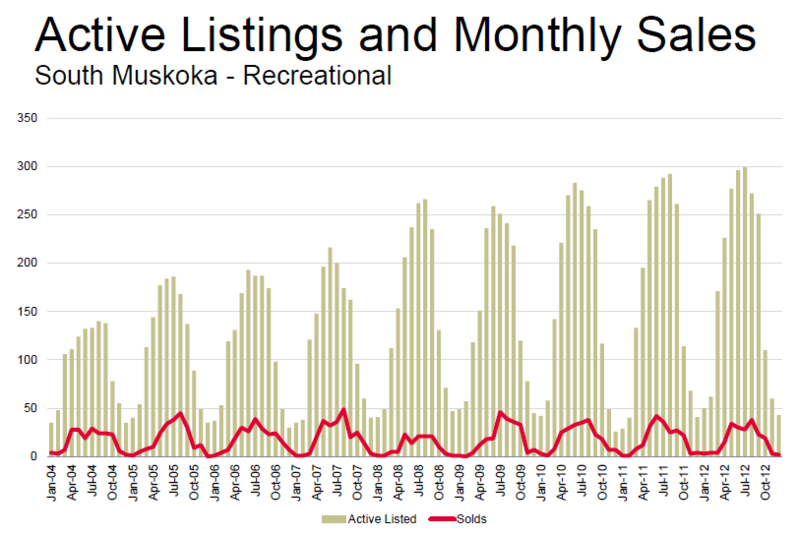 On the Muskoka Lakes there were 385 active listings at the end of October compared to 335 in 2013, an increase of almost 15 percent. In 2012 there were only 277. Compared to 2012 available recreational inventory has increased by almost 40 percent. Similar increases were evident in both Lake of Bays and the Haliburton Highlands. On Lake of Bays there were 138 properties available for sale at the end of October. In 2013 there were 117, an increase of 18 percent. In the Halibuton Highlands the increase of available properties is not quite as dramatic. This year there were 285 available properties, last year there were 275. Over the last three years sales have followed the available inventory. As the number of available properties for sale has increased there has been a corresponding increase in reported sales. In 2014 overall recreational property sales totaled 830, a 13 percent increase compared to the 732 sales reported to the end of October 2013. The Muskoka Lakes reported 253 sales, a 19 percent increase compared to the 212 reported sales in 2013. Interestingly both the Lake of Bays and Haliburton Highands markets produced results that were inconsistent with the overall market and the other recreational trading areas. Notwithstanding the increase in active listings both of these markets have remained static for the past three years. One explanation is price-point. The average sale price in this market is considerably lower than the properties available on Muskoka’s big lakes, Rosseau, Joe, and Lake Muskoka. Average sale prices in Muskoka’s big lakes have drifted downward since their pinnical in 2007, in some cases by as much as 25 percent. That downward drift appears to have stabilized. Buyers’ expectations are now closer aligned to that of Sellers, which in combination with increased choice, resulted in increased sales, including a large number of higher-end ($3 Million plus) sales. Chestnut Park’s agents were responsible for a record in recreational property sales. At the end of October our property sales by volume had increased by over 16 percent over last year. The value of real estate sold increased dramatically by 34 percent to $220,853,434, the highest volume of sales in the history of the firm. The previous best year was 2007, when $201,080,000 in dollar volume of recreational property sales was achieved. In the Port Carling market place, the Chestnut Park office out sold our nearest competitor office by 114 percent. Looking beyond 2014, and barring any unforeseen shocks to the economy – the recent meltdown of the stock market was disconcerting – 2015 should be a year similar to 2014. Assuming inventory levels remain high, anticipate an increase in sales volume by about 3 to 5 percent. As always it is fundamental that Sellers price their properties realistically. Any undue exuberance in pricing will result in properties lagging on the market, often beyond one season. As recent analysis of the Muskoka resale market disclosed that properties sold substantially below their original list price, in some cases as low as 25 percent. In addition, it took months, and in some instances two or more selling season before these properties sold. The value of all cottage sales set records, topping at $181.5 million. This was up 30 per cent from 2013. 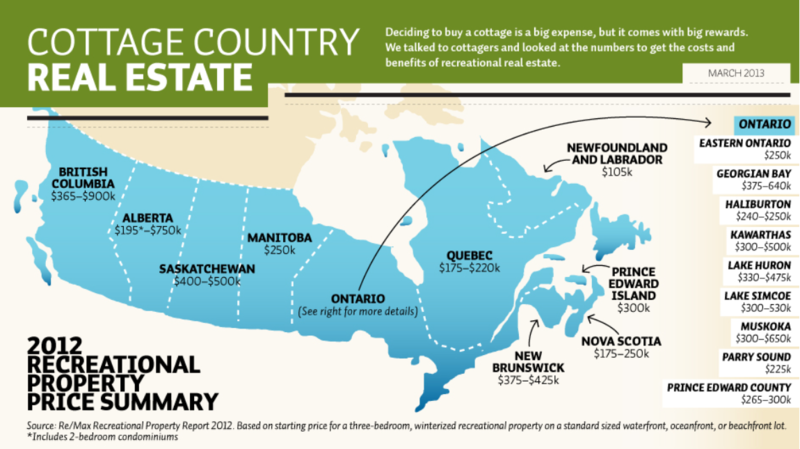 The median price for cottage sales rose seven per cent from May 2013 to $494,000, the second highest level on record. Interestingly, comparing recreational to residential sales the dollar value of all residential sales in May 2014 was a record $83.8 million. My take on all this? Due to the long hard winter, lingering snow and ice and then high water levels cottage sales which might have normally taken place in Spring may have stalled. Canadians were travelling to warm destinations even more as the winter lingered but since then we have seen increased motivation to purchase a cottage and enjoy the summer months. The Lakelands Association of REALTORS serves several major geographical areas including the City of Orillia, Gravenhurst, Bracebridge, Muskoka Lakes, Huntsville, Almaguin Highlands, Lake of Bays and Haliburton. Each of these areas has a unique blend of properties including the prestigious year-round recreational properties on large lakes such as Lakes Rosseau, Joseph, Muskoka and Lake of Bays and lower and mid-range priced cottage properties on the medium to smaller outer lakes. Feel free to contact me to discuss the Muskoka market! As your Realtor I feel it is my duty to keep you informed of the market. Some sellers as well as inexperienced agents have stated their concern about the recent lull in the Muskoka cottage market. In fact, there is a standard slow period which occurs from around mid to end June. We observe fewer showings and therefore fewer sales than in previous spring weeks. Experienced Muskoka realtors know this as “the June doldrums”. It is nothing to be concerned about, it happens every year. Children are finishing school, writing exams, attending proms, graduating and, adults in the corporate world are tidying up loose ends and completing projects so they can spend time with their families in the summer. Rest assured things will heat up once again and I expect to see new listings popping up from here on through the summer. Only 35% of properties that come to market on Lakes Muskoka, Rosseau and Joseph actually sell during a season. Short and sweet this week. Have a wonderful Canada Day long weekend at the cottage! For the second year in a row the recreational market has been negatively impacted by weather conditions. Winter has been long and hard, not only making access to cottage properties almost impossible, but creating an atmosphere not condusive to buying a recreational property. Cottages are associated with warm, sunny days, welcoming lakes, and motor and sail boats on the horizon. With snow drifts often taller than cottages, and frigid temperatures, those summer visions evaporated. There may not have been the high water issues that we experienced last year, but conditions were sufficiently challenging to keep sellers from considering listing their properties for sale. The decline in inventory in the first four months of 2014 is quite striking, a pattern that might be a reflection of broader market trends. During the first third of the year the Muskoka Haliburton Association of Realtors reported processing 3,097 properties for sale. This compared to 3,235 properties for sale during the same period in 2013 and 3,664 in 2012, declines of 4.3 and 15 percent respectively. This pattern repeated for recreational properties. In the Haliburton region inventory of recreational properties has declined from 295 available properties in 2012, to 236 in 2013 and down to only 173 this year. These declines amount to 26 percent since 2013 and 41 percent since 2012. The declines on Lake of Bays are similar but not as dramatic. There were 109 recreational properties available for sale in 2012, 100 in 2013, and 92 this year, declines of 8.2 percent and 15.6 percent. The situation on the Muskoka Lakes, Lake Rousseau, Lake Joseph, and Lake Muskoka is not dissimilar. There were 243 active available listing of recreational properties in 2012, 232 last year and only 200 this year, declines of 4.5 and 17.7 percent. The Association reported only 760 recreational properties for all Association trading districts combined, down from 1,025 in 2012 and 867 last year. The decline from 2012 is more than 25 percent. Anecdotally these declines can be explained by the severe weather conditions experienced in 2013 and this year. But this explanation sheds no light on why inventory levels have decreased so dramatically from last year, when weather conditions were equally as inhospitable as they were during the first four months of this year. It may be too early to tell, but demographics may be playing a role in these statistics. As the population ages and becomes more settled there may be fewer potential sellers. It will be interesting to see how this data unfolds during the remainder of the year. Sold recreational properties have also declined since 2012. Weather conditions have clearly had an impact on the number of properties sold. In the Haliburton area sales have declined from 35 to 28 in 2012 and 2013 to 25 in the first four months of this year. On Lake of Bays from 20 to 15 to 10. The only recreational trading district to reverse this trend is the Muskoka Lakes. In 2012 there were 25 reported sales. Last year reported sales dropped to 18, but this year, notwithstanding the weather conditions, sales have increased to 23, an increase of 27 percent. It is not surprising that with fewer properties available for sale, and inhospitable weather conditions, that sales have declined. Because of the divergent nature of cottage properties, prices are affected by such features as location (a particular lake), exposure, elevation, water depths and boat traffic. As a result determining average sale price trends becomes more challenging than in an urban environment where numerous sales of comparable properties allow for a fairly accurate reflection of current market values. Moreover sales take place at a much more rapid pace. For example in the Toronto housing market, in April average days on a market for all properties sold were only 20 days. A review of sales that took place in March as reported by the Association indicated that median prices have declined by approximately 8 percent compared to March 2013. As I have indicated in previous reports, a market analysis of the first four months of recreation property sales is not productive since the market is normally dormant during this period. However what this early data indicates is that caution should be exercised in pricing. Sellers must be mindful that the recreational market is not the robust Toronto resale market, where multiple bids on properties are common. Recreational properties will sell, and they will do so quickly, if priced realistically. The market fluctuated during the course of the year, predominately due to weather conditions. The region was literally flooded in the spring, with high water washing out roads, filling boat houses and detaching docks from their moorings, sending them down lakes and rivers. These conditions were not conducive to either listings or sales, and the market sagged in both categories. It was not surprising that sales and inventory declined by 20 percent in the spring as compared to 2012. Weather conditions improved throughout the summer months and into the fall, and correspondingly the market improved on a year-over-year basis both as to inventory levels and sales. By the third quarter of the 2013 inventory levels were matching last year, and although recreational properties sales were slightly off in some regions, there was a slight improvement on the big Muskoka Lakes. At the end of the year annual results were not dissimilar to the results achieved in 2012. By December inventory levels were almost identical to 2012. In 2013, 9630 listings were processed by the local Association. A mere 0.5 percent less than the 9687 listings processed in 2012. Overall recreational property sales for the entire region administrated by the Muskoka, Haliburton and Orillia Association showed a moderate decline. By year-end 797 properties had been reported sold, a decline of 2.5 percent compared to the 818 that were reported sold in 2012. Sales in the Haliburton Highlands, Lake of Bays, and Muskoka’s big lakes faired better than the market as a whole. By year-end the Haliburton Highlands saw sales increase by 6 percent compared to 2013, from 237 last year to 251 this year. Lake of Bays was virtually unchanged in 2013. In 2012, 91 recreational properties were reported sold, and a similar amount sold in 2013. The market on Muskoka’s big lakes showed the largest improvement. In 2012 there were 205 properties reported sold. This year that number jumped to 223, an increase of 8.3 percent. Although it is difficult to accurately compare recreational property sales because of location, exposure, water depth, elevation and improvements, it would appear that notwithstanding an increase in sales there has not been an appreciable increase in average sale prices. Many of the sales that took place on the big lakes were listings that had been on the market for more than one season and after price reductions. Urban centers in 2013 saw price increases approaches 8-10 percent. Interestingly the peak for sales and sale prices, both in recreational and urban property sales, remains 2007. Since the recession of 2008-2009, recreational property sales and prices have not recovered as have urban market sales and prices. In retrospect recreational property values had been driven to unsustainable high levels from 2000 to 2007. Since then buyers have become more demanding, seeking value for purchases that they consider to be discretionary. This is, of course, unlike urban environments where sales are most often driven by necessity. Chestnut Park had a strong year in 2013, with total sales of recreational properties exceeding $ 100 million. On the big lakes, Chestnut Park’s Port Carling office exceeded the next closest brokerage by almost 100 percent in sales volume. Looking forward, 2014 should be a year in which we see modest increases in both sales volume and average sale prices. Canada’s economy has not recovered, and all indications are that growth will be sporadic and modest. December’s employment numbers were not encouraging, resulting in Canada’s unemployment rate rising to 7.2 percent, with many of the jobs lost in Ontario. There are also indications that mortgage interest rates will rise, albeit marginally, in the latter half of 2014. Notwithstanding the foregoing confidence in the economy is increasing, and confidence is a necessary ingredient to recreational property sales. This in turn will be reflected in increased sales and sale prices. I anticipate sales volumes will increase by 5 to 6 percent, with average sale prices increasing by 3-4 percent. As in the past, particularly on the big Lakes, sales will be driven by pricing. The discretionary nature of recreational property sales requires that buyers see value before they proceed to offers. The cottage market fluctuates with the seasons. Some years we see cottage property sales beginning in March if the weather has been warm and sunny while other years it is April or May before we are able access some driveways and private roads. This year we saw a late start as the cold weather hung on, lake ice lingered and then there was the flooding which greatly affected the lakes, cottage properties and access in and around Muskoka. From January 1st to date there have been 81 sales on Lakes Joseph, Rosseau and Muskoka. Comparing this to last year’s 93 sales we are definitely under par with the number of cottage waterfront recreational properties sold during the first half of the year. The major significant difference I have seen is the price point of these sales. Higher priced inventory is selling while lower priced (under 1 million) is down from last year. There have been a total of 4 sales in the $5 million plus range compared to only 1 in 2012, having myself represented the buyer in one of this year’s 5 million+ sales. The above graph demonstrates the decrease in sales of the under $1,000,000 properties while sales over $5,000,000 have increased. And you can see that while there was an increase in sales in the over 5 million range, there has only been one cottage sold so far between 4 and 5 million dollars. Sales between 2 and 3 million have remained consistent over the last 3 years while ov erall total sales have decreased since 2011. The status quo stands, as always, well priced listings sell while overpriced listings sit on the market and become stagnant. I can’t emphasize enough the importance of pricing correctly the first time. Some sellers believe we are in an erroneous market and it needs time to correct itself. In reality, this has already happened. Gone are the days of 2006 & 2007. In today’s market, buyers are smart and sophisticated and will hold on to their money until they find a property which is fairly priced for today’s market conditions. Add to this the changes in lending from financial institutions and these facts clearly explain the decrease in sales of the under $1 million product. It is more common to see financing on under 1 million properties whereas purchasers on 5 million plus properties rarely even discuss financing. The warm weather has finally arrived after a cold start to Spring and the cottage selling season is underway. Are you thinking of selling your waterfront recreational property? Have you considered obtaining an Opinion of Value otherwise known as a Market Evaluation? If so there are some things to keep in mind. An accurate Market Evaluation requires presence and is not something that can be done over the phone or internet. My attention to detail assists me in researching all relevant aspects of your property so I can conduct a thorough comparative market analysis. I do this by searching the database of all comparable properties listed or sold in your area, most of these properties I have personally seen, shown and taken pictures of and perhaps even previously sold. With this current market data and my 19 years of selling waterfront recreational property in Muskoka, I will be able to determine what your property should sell for if you decided to put it on the market. For a FREE, No Obligation Home Evaluation, please contact me or leave your contact information at the bottom of the page so I can get back to you. Whether you are buying or selling recreational waterfront property in Muskoka or anywhere else in Canada, it is important to have all the facts. Here is the 2013 Recreational Property Report from Royal LePage. This report contains detailed information by region. You can find Muskoka on Page 10 of this report. If I can be of any assistance or you would like to discuss current Muskoka market conditions please do not hesitate to contact me. Muskoka 2012 in Review - Market Report now available. Below are the waterfront recreational property sales statistics. Click here to view the entire report which includes residential sales statistics as well. 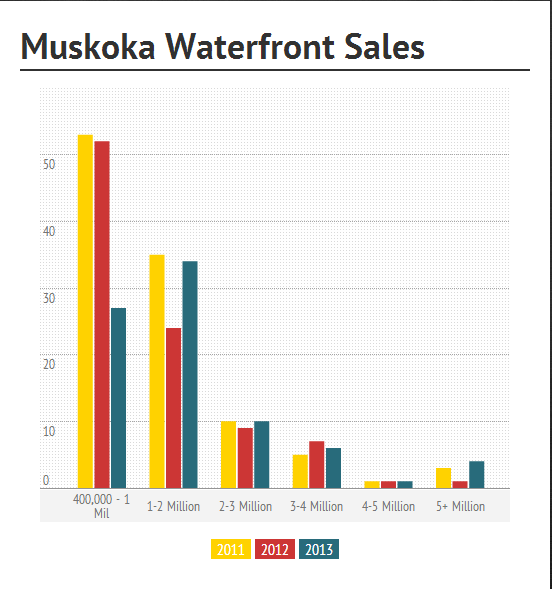 The above graph compares total sales of all Muskoka waterfront properties over the last 12 years. The above graph illustrates the active listings and those sold month by month showing peak sales in Summer. You can see an increase in the number of listings available each year. Listing your property in the Spring gets it on the market in time for peak selling season. Another important point to consider is that a well priced property sells quickly whereas an overpriced property becomes stagnant. 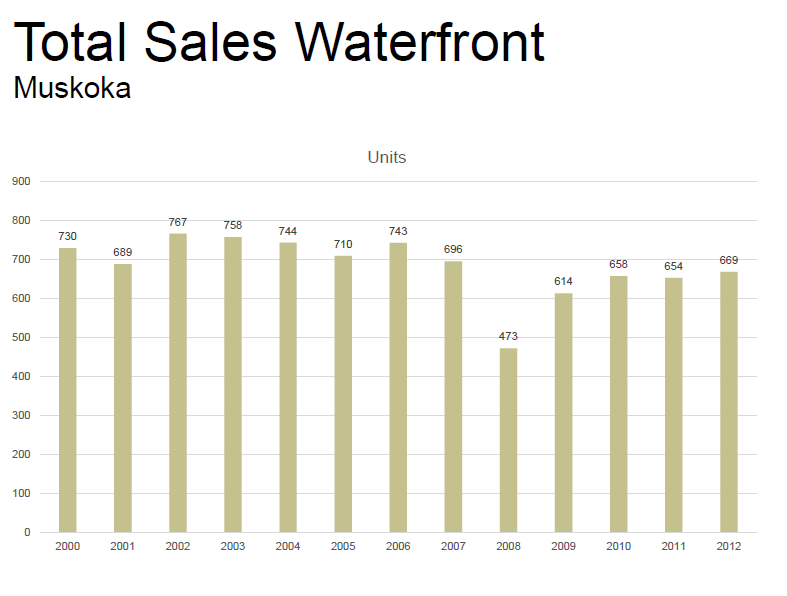 The first graph illustrated the number of sales of all waterfront property in Muskoka. 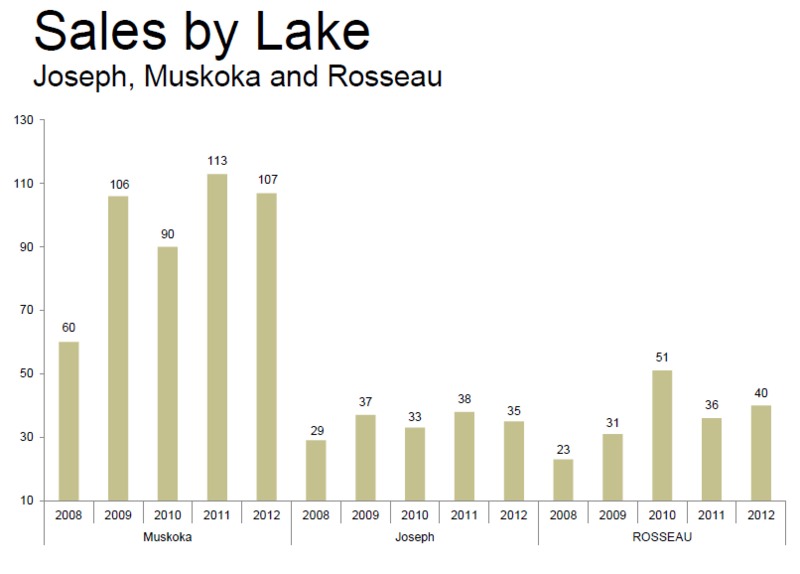 The above graph breaks down the sales of only the big 3 lakes, Lakes Muskoka, Joseph and Rosseau from the year 2000 to 2012. 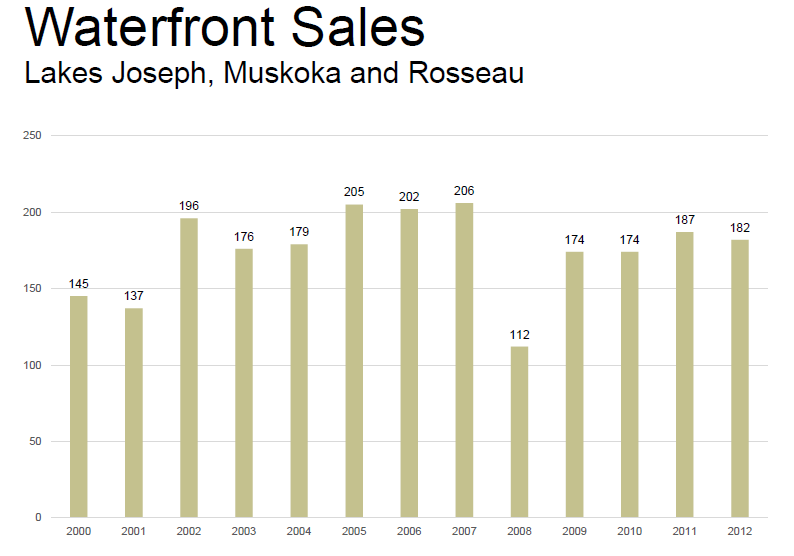 The above sales graph is broken down by lakes; Muskoka, Joseph and Rosseau with the majority of sales being on Lake Muskoka. This is due to the fact that there are more properties on Lake Muskoka than Rosseau or Joseph so we understand the sales will be higher here. 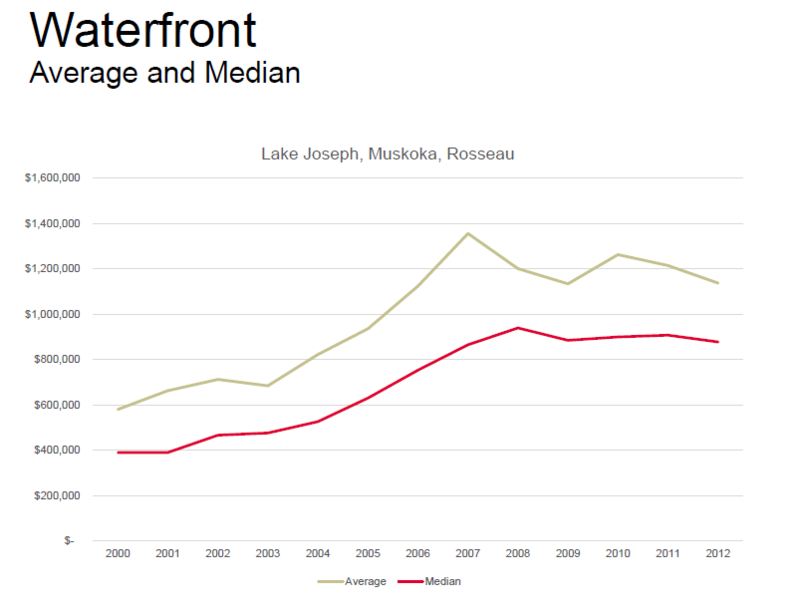 Here we can see the average and median sale prices across Lakes Joseph, Rosseau and Muskoka, since the year 2000. If you have any questions about this report, current trends or the upcoming season contact me so that I may provide you with all the details. As we fast approach cottage season I thought this infographic "Cottage Country Real Estate by the Numbers" courtesy of Cottage Life might interest you. My clients have been asking me "when is the best time to list our cottage?" I have two answers to this question. 2. May, when landscaping is starting to pop and flowers are in bloom. 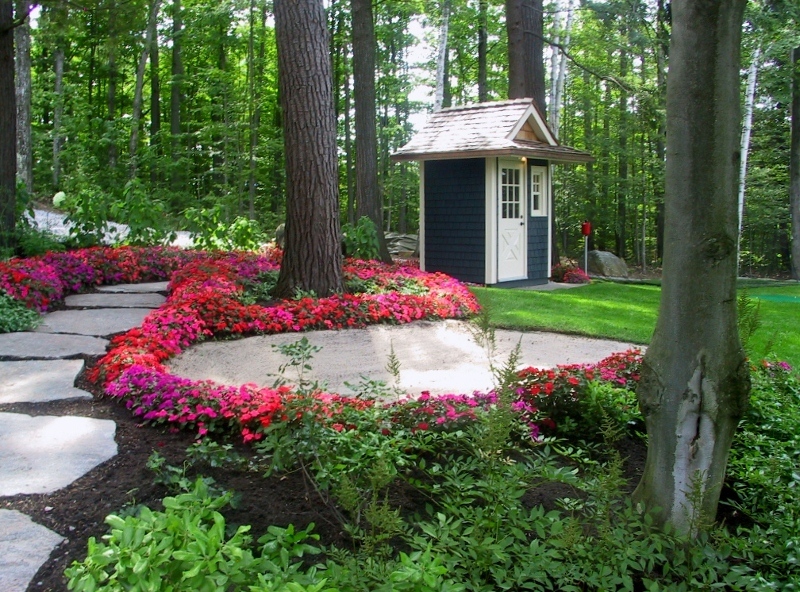 Any cottage property looks best when it’s dressed. If you would like more information or a free market evaluation of your property, contact me at jack@muskoka.com. Listing a property in the winter during ice and snow season, no greenery, no lawn furniture displayed, boats in the water, etc. will give other agents and buyers the impression that you have a sense of urgency to sell. This is not the ideal time at all and I would think that offers would come in much lower than in the Spring market. Spring is definitely the best time to list. After a long winter, buyers are looking forward to finding and purchasing their dream property, while allowing for time to close the deal and plan their Summer in Muskoka. If you do want to list prior to the Spring I can inform you of the key things you will need to consider. Great exterior pictures are essential to showcase how beautiful your property really is. Call or contact me to list your property in time for the Cottage Life show! “Municipalities in Ontario are gearing up to force the province to grant them the authority to charge a municipal land transfer tax (LTT) on home buyers. Currently allowed only in Toronto, this tax may potentially spread to other regions of Ontario. It threatens to increase the cost of home ownership province-wide. According to a recent study by the C.D. Howe Institute, this tax has resulted in a 16 percent drop in the volume of residential home sales in Toronto. It has meant that home buyers pay an average $15,000 up front every time they move, due to the municipal tax over and above the provincial land transfer tax. The spread of this tax to other regions of Ontario will increase the cost of home ownership across the province. As a REALTOR®, this will affect your business. Extending the power to levy the municipal LTT to other municipalities in the province would lower home values by adding thousands of dollars to the cost of residential transactions. I will keep you posted as information that could affect your Muskoka cottage property becomes available. Contact me for more information on this issue and other important real estate news. The media is starting to report that the real estate economy is showing signs of change. We seem to be entering a Buyers’ Market in the larger urban communities. In London, Newmarket and even Toronto the media is stating that the market has changed from a Balanced Market to a Buyers’ Market. While the CMHC forecasts for Toronto did not project this change in conditions, BMO Nesbitt Burns analyst Robert Kavcic believes that with the reported decline of 21% month over month in sales for September and the increase in the number of active listing by 4% Toronto will now see a shift to a Buyers’ Market. This will result in a leveling off or even decline in prices. So what does BUYERS’ MARKET really mean to you as a buyer or a seller? Well, if you are a qualified buyer who is ready to purchase now, then you will have an opportunity to make a great investment. The value of the property you will purchase may be at its lowest. Whether actual average sales values decline or just flat line will remain to be seen, but no matter what now is a great time to be a buyer. There is a higher level of inventory and if you cannot negotiate to a price you are content to pay you will be able to move on to the next available property that is suitable. If you are a seller your position is honestly not as good. Contact me to discuss your options. If you can wait to sell, then that may be advisable. When we look at the history books we see that all this is part of a cycle and even if values dip they have historically always recovered. Hold on to your property and even work on improving it through this cycle and be ready to sell when the tide turns back in your favor. However, if you need to sell now then you will need some advice about pricing. Do not be tempted to put it on the market at what you may have gotten last year because it will sit and stagnate. You will get frustrated and your experience will become a very unhappy one. When there are more sellers than buyers human nature dictates that the buyer who looks at your home will want to be confident he is getting a great deal. You will have to stay competitive to sell. 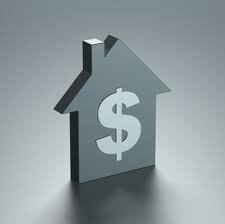 Many sellers, when they sell only look at the differential between what they paid and what they sold for. Factor in what you would have paid in rent and the fact that your money depleted a mortgage debt, not your bank account and even if you end up not realising your hoped for profit you will very likely find you did not lose anything at all. Keep an eye on what is available and if you see anything that interests you contact me so that I may provide you with all the details. My prediction is it will be best to wait until spring to list your cottage if you are selling, and on the flip side, to have the best choice in product available, as a buyer.